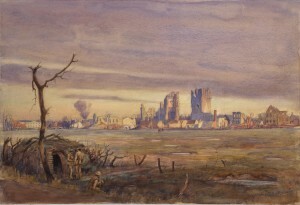 The Second Battle of Ypres marked the Canadians’ first major engagement. In 1915, the Germans were attacking Russia in the east. On the Western Front, they were mostly on the defensive, though they continued to mount local attacks if conditions were favourable. 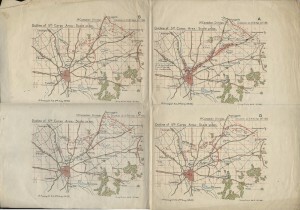 To probe Allied defences, cover the movement of troops to the Eastern Front, and test their new weapon, chlorine gas, the Germans prepared for a limited offensive in Belgium in spring 1915 against the Ypres salient, a bulge in the Allied lines. The last major Belgian town in Allied hands, Ypres provided a defensive position from which to protect French ports on the English Channel. It had to be held. On 22 April, two Canadian brigades were in the front lines, with a third in reserve near Ypres. At 5 p.m., the Germans released gas against the French 45th (Algerian) Division to the Canadians’ left. An enormous green-yellow gas cloud, several kilometres long, drifted towards the French lines. When it rolled over their positions, French troops either suffocated or fled, their eyes and throats burning from the chlorine. Most of the gas missed the Canadians, but the French retreat had exposed the Canadian’s left flank and threatened the destruction of the whole Allied position in the salient. General Alderson’s units shifted positions to cover the gap, but the German gas attack had torn a huge hole, several kilometres wide, in the Allied line. From 22 April to 25 April, the Canadians fought tenaciously to defend this exposed position. Outnumbered, outgunned, and outflanked, on the 24th they faced a second, this time direct, chlorine gas attack. The Canadians counterattacked to stall the German advance, and then slowly gave ground, buying precious time for British troops to be rushed forward. The Canadian Division’s trial-by-fire at Ypres earned the Canadians a reputation as tough and dependable troops, but they had paid a high price: some 6,000 casualties over the four-day battle. 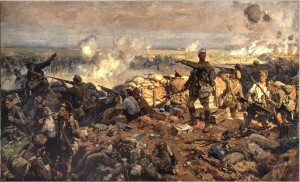 War artist Richard Jack portrays the Canadian stand during the Second Battle of Ypres, which he did not witness. He painted this enormous work of art, with the canvas 371.5 by 589.0 centimetres, in his London studio. It was the first of almost a thousand works, by over one hundred artists, commissioned by the Canadian War Memorials Fund (CWMF), an organization established by Lord Beaverbrook to document Canada's war effort. Sir Edmund Walker, who sat on the advisory board to the CWMF, felt that Jack captured the achievements of the Canadians during the battle, but felt the work would not resonate with Canadians, who, he felt, were "not likely to appreciate such realistic treatment of war." 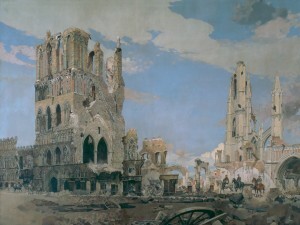 He was wrong and Jack's painting remains an iconic work from the First World War.